Alpha Phi Omega Graduation Cords can be worn to represent the largest national co-educational service fraternity in the nation. The fraternity is built around the ideals of learship, friendship, and service. The colors of APO, which is short for Alpha Phi Omega, are Royal Blue and Old Glory Gold. This shows their link to the Boy Scouts of America (BSA), with whom they share common values. Members of APO also often volunteers with the BSA. 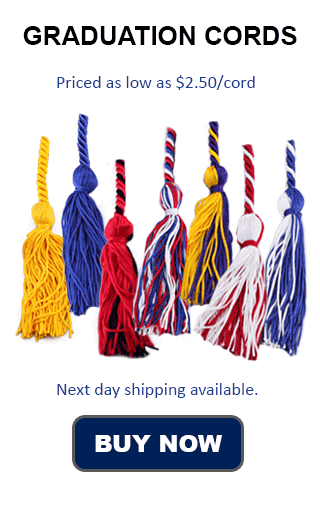 The colors of Alpha Phi Omega (Royal Blue and Gold) easily translate to great honor cord options from Honors Graduation. We have a beautiful Gold and Royal Blue braided cord that incorporates both colors. This can be purchased as either a single or double cord. Another way to get Royal Blue and Gold in graduation cords is to do a double cord. For the colors of Alpha Phi Omega Royal Blue should be used as one cord color, and Bright Gold for the second We have other blue and gold options for our honors cords; light blue, navy blue, yellow gold, and antique gold (old gold). However the colors that represent APO are royal blue and bright gold, so these are the colors that should be selected if opting for a double cord. There are 350 active chapters of APO in the US. In addition to US chapters there are also 243 chapters in the Philippines and 1 in Australia. Alpha Phi Omega is linked with the Boy Scouts of the Philippines, just as the US counterpart relates to the Boy Scouts of America. Being a Boy Scout is not a requirement to become a member of APO, however, membership will be granted to students who were at sometime connected to the Boy Scouts, whether it be as a cub scout, boy scout, merit badge counselor, or other similar positions. Bill Clinton, the 42nd President of the United States, was a member of Alpha Phi Omega.